Emaho retreats proudly invites you to their first yoga retreat at Radhadesh, in the Ardennes region of Belgium, from August 28th to September 1st, 2019. Located in the Chateau de la Petit Somme, surrounded by unspoiled flora and fauna and long stretches of forest and countryside, this is a wondrous place to accomplish one’s spiritual practice (Sadhana). A view of the Chateau de Petite Somme (right) and the cafeteria, bakery, and guest house (left). Join us for mindful walks in the forest, intensive Jivamukti Yoga sessions in the morning, and meditation, Yin & Restorative yoga in the evening. There will also be Kirtan (sacred chanting) every evening, as is customary in the castle, and a special Q and A session with Manu about Kirtan and Bhakti Yoga, or the Yoga of devotion. Radhadesh provides comfortable and affordable accomodations for guests. 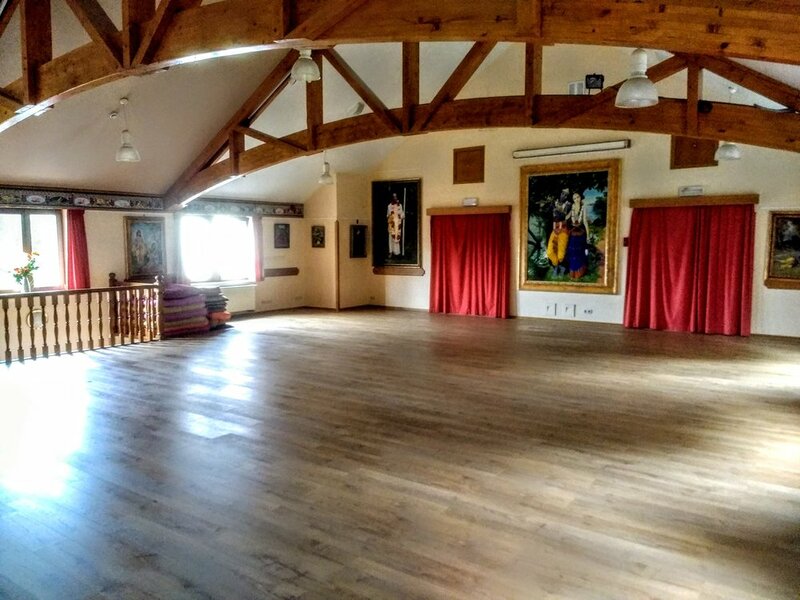 The hall for Yoga is spacious, beautiful, and has a great acoustic. Prices include both room and board and all yoga sessions and activities offered by Ben and Jennifer. Arrival and departure as well as individual trips are not included in the price. Accommodations: We only offer shared double rooms. Healthy, vegan meals will be provided by the Cafeteria. 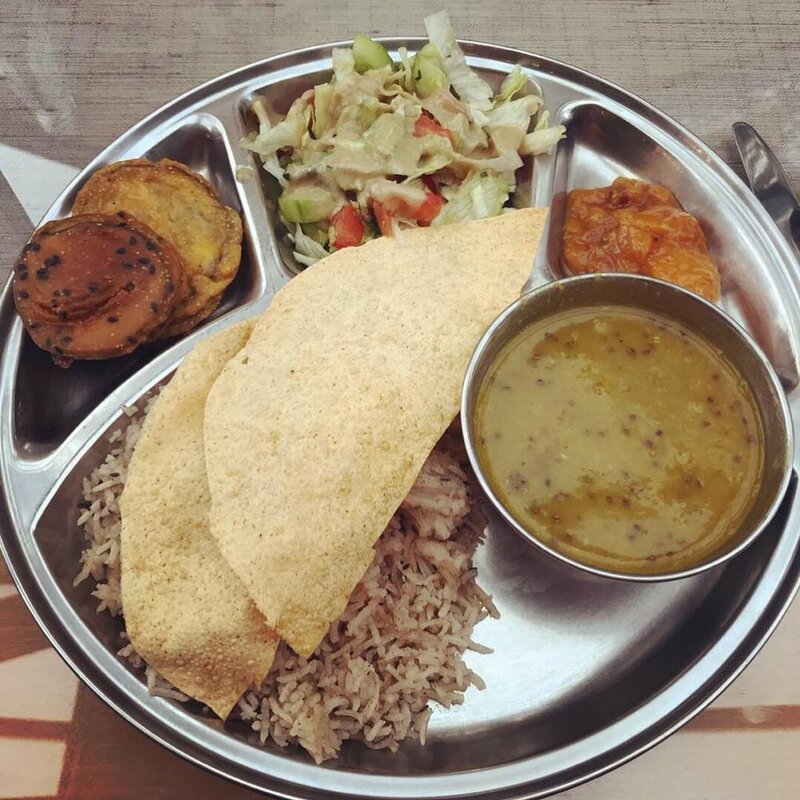 We will offer a big brunch after the morning yoga session and dinner in the evening, as well as snacks in between. LIMITED to 14 participants. All registrations are subject to approval. Yoga classes and activities will be held in English (with individual German or French instructions if needed). Jennifer and Ben had the good fortune of meeting Manu and Sita, the directors of the guest house at Radhadesh, at a Kirtan in Paris where Ben also played, and upon accepting their invitation to visit, they fell in love with the castle, the energy, the food, and even the cows that are living a peaceful life on the campus. Retreatants will have plenty of free time to explore the natural wonders on the property. Emaho is a Tibetan word that means wonderful, amazing, or miraculous. Founded by Jennifer Schmidt and Ben Beirs in 2018, Emaho! Retreats are grounded in the principle that the ordinariness of everyday life is extraordinary, and that through the practices and foundations offered at their retreats, students can become more in tune with the timeless wisdom and goodness that is waiting to be uncovered and recovered within all of us. We would love to practice with you this summer at Radhadesh! Emaho! 1) Send an Email with your full name, address and phone number to events@yogitarist.com. Please let us know your yoga and/or meditation experience, if any, and if you have any injuries or food allergies. Let us know if you have a roommate request. 2) Secure your spot with a 108 EUR, non-refundable sign-up deposit, see payment options below. 3) You will receive confirmation from us by E-mail once sign-up deposit is received. This E-mail will serve as an invoice with the due amount stated (minus sign-up deposit), payable before July 15th by payment option of your choice (see below). *Early Bird: Register before May 15th and save 58 EUR. Full payment is due upon registration. Please find payment options below. Can be made by bank transfer or PayPal (Family & Friends). Up until June 15th, 2019, any amount paid in excess of the deposit will be refunded in full. From June 15th, 2019 to July 15th, 2019, 50% of any amount paid in excess of the deposit will be refunded. After July 15th, no refunds will be given. In case of cancellation by us, the organizers, all payments, including security deposits, will be refunded in full. For more information and to register, please email events@yogitarist.com. Thanks! Attendance is encouraged but not mandatory.